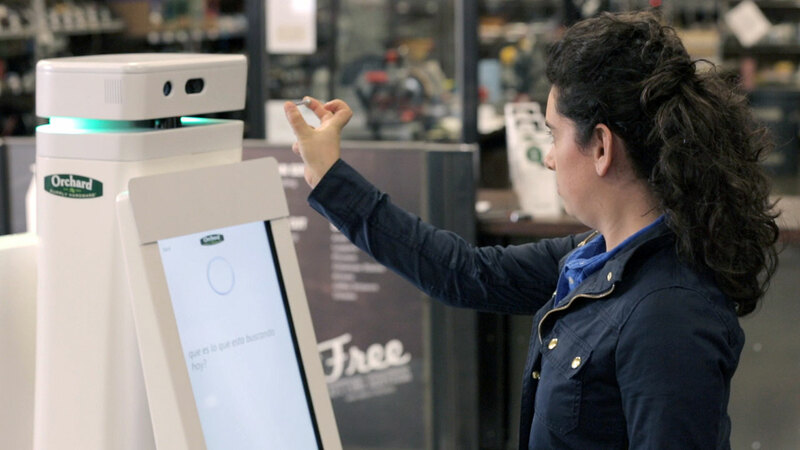 NEW YORK -- Lowe's is testing whether robots can improve its customer service, like helping a shopper find a match for something as simple as a nail. Four robots are being tested an Orchard Supply Hardware store owned by Lowe's Companies Inc. in San Jose, California. The robots dubbed OSHbots look like white columns with two large black screens on either side of them, and wheels to help them move. They are equipped with 3D cameras so they can scan and identify items. And customers can research items they want to buy on their screen. Then the robot can lead them to the aisle where an item is located. "They're based on making a science fiction story a reality," said Kyle Nel, executive director of Lowe's Innovation Lab. The robots also have a database of what inventory is in stock at the store, so they can let customers know if something is out of stock or not. "People can come in with a random screw and say Mr. Robot, I need more of these, and if we do have it in the store, they can find it," Nel said. The robots can speak in English and Spanish. Lowe's started working with Fellow Robots, a technology company in Silicon Valley, in November to develop the robots. The cost of the project is undisclosed. Lowe's has been working on infusing more technology into its customer service. It has also developed a "holoroom" that can let users see what different pieces of furniture look like in different rooms in a virtual-reality environment.